From March 22nd, PHH-60 and PHH-80 series including the accessories have been discontinued. Looking for a possible substitute, please see the PHH-127 series for details. For the rest of the stock, please reach out to our customer service team to get the detail for last time buy opportunity. The POCKET PAL™ Series of handheld instruments are rapidly becoming an industry favorite for field and laboratory applications. The electrodes are designed for easy field replacement and can be quickly calibrated with easy access twopoint calibration potentiometers. Digital display, chemical resistant ABS plastic housings and probes that fold-away for protection make the POCKET PAL series ideal for portability and reliability. The low cost PHH-81A is ideally suited for general pH measurements in field, plant, production line or laboratory environments. The PHH-81A features manual temperature compensation and a standard BNC connector allowing for use with a wide variety of laboratory and industrial pH electrodes. For versatility in the field or the laboratory, the PHH-60BMS/TDS and PHH80BMS/TDS feature the ability to make pH, conductivity and total dissolved solids measurements in one handheld instrument. The PHH-60B measures pH from 0 to 14 and conductivity from 0 to 19,990 µmhos or ppm, and the PHH-80B extends the conductivity measuring range to 199,900 µmhos or ppm. Recessed switches control all functions, and an easy access panel contains adjustments for pH calibration and slope, zero and span for conductivity. Features include automatic temperature compensation (ATC), detachable electrodes and integral benchtop stand. The PHH-82B is a dual-function instrument that measures pH and ORP (oxidationreduction potential). 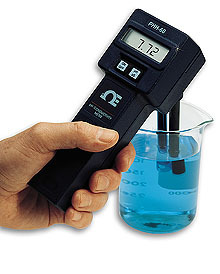 It is ideal for measurements of ORPs that are pH dependent. Applications include swimming pool maintenance, drinking water disinfection, chrome reduction and cyanide destruction of electroplating. Features include detachable electrodes and integral benchtop stand. 참고: Each unit supplied with sensor(s), screwdriver, vinyl carrying case, battery and user’s manual.